I thought since we have closed down the DSSP blog, and some of you are new followers to my personal blog, it would be fun to share some Christmas projects we’d created in year’s past. The blog is still up with the old posts, so I’ll link to the instructions over there. Enjoy! Heather’s Wreath Ornaments There’s a few so follow the link to see more variations. 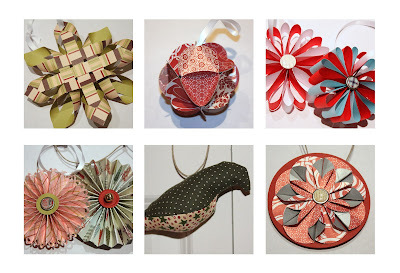 You can also see Gretchen’s take on the ornaments here. Later this week I’ll share some of the gift wrapping ideas and Christmas treats from year’s past. Hope you enjoy!